The important topics of nano-optics and plasmonics occupied students and faculty at the recent 2012 Winter College on Optics at the Abdus Salam International Centre for Theoretical Physics (ICTP) in Trieste. SPIE, the international society for optics and photonics, is among eight organizations that co-sponsor the annual event and other ICTP programs to meet the needs of students and scientists in developing countries. Chiara Bernardoni, at left above, wife of the late Professor Denardo, was present to congratulate 2012 Gallieno Denardo prize winner Selçuk Aktürk. The important topics of nano-optics and plasmonics, with applications in solar energy, lasers, and research, occupied students and faculty from 40 countries at the 2012 Winter College on Optics at the Abdus Salam International Centre for Theoretical Physics (ICTP) in Trieste. SPIE, the international society for optics and photonics, is among eight organizations that co-sponsor the annual event and other ICTP programs to meet the needs of students and scientists in developing countries. Held 6-17 February, the Winter College was attended by 113 students from 40 countries, and instructed by 17 faculty from 9 countries. Directors were SPIE Fellow Zohra Ben-Lakhdar (University of Tunis), Mario Bertolotti (University of Rome), and Nikolay Zheludev (University of Southampton). New to the program this year were hands-on experiments provided by Angela Guzman (CREOL, the College of Optics and Photonics, University of Central Florida) and SPIE Fellow Anna Consortini (University of Firenze). SPIE provided participants with free access to the SPIE Digital Library during the Winter College. 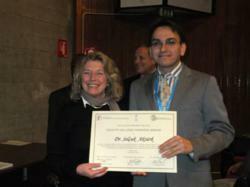 The 2012 ICO/ICTP Gallieno Denardo Prize was awarded to Selçuk Aktürk of the Istanbul Technical University, who made a presentation on his work in ultrashort optical pulses and nonlinear optics. In addition to the annual Optics Winter College, SPIE provides $30,000 annually to support an optics staff position at ICTP. In conjunction with ICTP, SPIE provides free SPIE Digital Library access in participating countries through the eJDS program, and helps fund a laboratory pursuing novel research in spectroscopy with quantum cascade lasers, available to participants from developing nations. The lab is housed at the Istituto Nazionale di Fisica Nuclear (INFN) and run in collaboration with the Institute for Nanoelectronics, Technische Universität München. Along with Svanberg, SPIE Past President María Yzuel (Universidad Autónoma de Barcelona) represented SPIE at a meeting of the Trieste System Optical Sciences and Applications (TSOSA) Advisory Group, which advises on the coordination of ICTP activities in optics and photonics.